With the tablet market in full bloom, Asus doesn’t seem to be slowing down its netbook production at all. While we expect the AMD Fusion based 1015B netbook to be released soon, Asus is still updating their Intel Atom line of netbooks. 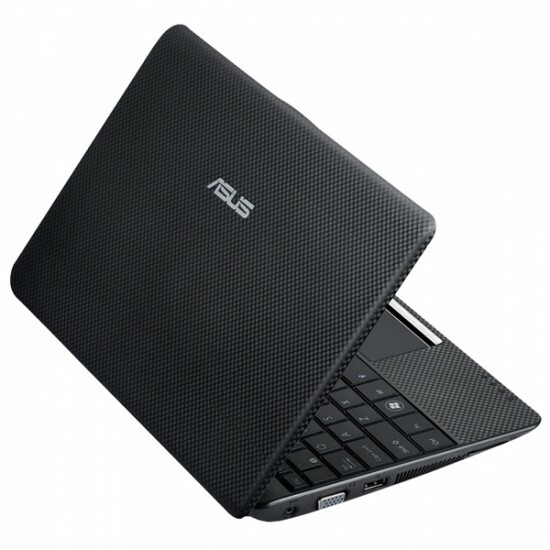 The Eee PC 1101PX (labeled R011PX in certain areas) is the updated version of Asus’s older 1001PX netbook. While the 1001PX made do with an Atom N450 processor, a 160GB HDD and DDR2 RAM, the new model was updated to include a 1.66 GHz N455 Intel Atom Processor, 1GB DDR3 RAM, and a 250GB HDDThe netbook will have the usual 10.1” display with a 1024x600 pixel resolution, Wi-Fi, Windows 7 Starter edition, and the typical array of netbook ports. The 1101PX should also have the same carbon-fiber lid design as its predecessor. What’s intriguing about the 1101PX is the presence of a 7-cell battery instead of the older 3-cell battery found in the 1001PX. The extra cells should keep the netbook churning away for a good amount of time and we await an official battery life estimate. As of now the netbook will be available in Germany in the coming weeks for the price of 499 euros. However, it should make its way stateside soon enough.